Muffin’s Halo – Worldwide Leading Blind Dog Halo Harness. The SAFEST and MOST TRUSTED device on the market and the ONLY blind dog bumper that is detachable which is very important. For Pet Parents who want the BEST for their Blind Dogs. in an average of 2-3 Business Days. “Muffin’s Halo has taken a major problem for blind dogs – the risk of head trauma – and solved it in a remarkable way, improving their quality of life substantially. It only makes sense to do our part in helping pet parents afford this impressive product by covering it under Wellness Rewards.” – Laura Bennett, CEO and Chief Embracer. Our blind dog halo and blind dog vest has reached new heights. 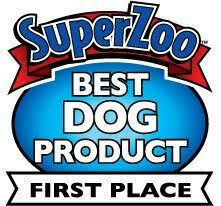 With your support our blind dog products will be available at your local pet store. Introducing our New Muffin’s Blind Soldier Camo Halo Style! Muffin’s Halo for Blind Dogs ® is a 3-piece must-have device to help blind dogs transition! This twice-patented blind dog product offers head protection, and is highly recommended by Animal Ophthalmologists and Veterinarians worldwide. MADE IN THE USA. Blind dog halo vest available worldwide! Blindness in dogs is commonly caused by: cataracts, glaucoma, SARDS, trauma, retinal diseases and diabetes. While any breed can be affected, the following pure breeds are more prevalent than mixed breeds to genetically be inclined to develop cataracts: Cocker Spaniel, Poodle, Siberian Husky, Schnauzer, Old English Sheepdog, Samoyed, Golden Retriever, Maltese, Boston Terrier and Yorkshire Terrier. For glaucoma: Shih Tzu, Siberian Husky and Bouvier des Flandres. Find out how to get your blind dog halo today! Muffin’s Halo is a custom-designed product to protect blind dogs of all sizes from bumping into walls and objects. It is a great aid to help blind dogs become familiar with existing or new surroundings quickly. Muffin’s Halo is a lightweight and comfortable blind dog halo. This blind dog halo product does not hinder a dog’s normal daily activity and gives them their confidence back! Muffin’s new Blind Soldier Camo Style won SuperZoo Best Dog Product 2016! Thank you to all those who voted for us again!